Plumbers are called in to install, repair and examine piping systems that are used for moving water, sewage and gases in and out of buildings. They connect pipes to various types of industrial and residential fixtures, such as heating and cooling units, sinks, washing machines, bathtubs, water heaters and toilets. Plumbers commonly use hand tools, like wrenches, cutting saws and hammers, or hand and power tools, which could include welding equipment. They also use advanced diagnosing equipment to determine pipe pressure or to locate faulty equipment. fit weather-proof materials, joints and flashings to roofs, chimneys and walls. An experienced plumber might specialise in sheet metal work for industrial, commercial or historical buildings. Why did you choose plumbing? I have an uncle who is a plumber and he is very successful, so the realities hit home for me when I had to make career decisions. The fact that the plumbing industry is a necessity-based business is appealing, as this ensures financial stability and job satisfaction with an international future. What training did you undergo? I received institutional training from a regular government facility in the UK and completed my apprenticeship working for various companies. I eventually started working for myself after qualifying and receiving my Trade Diploma. This took the better part of four years to accomplish. There are quicker ways to do a Trade Test these days. 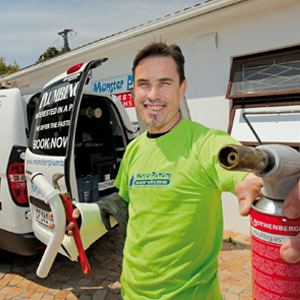 The Monster Plumbing college advisor can assist anyone interested, see www.plumbingcollege.co.za. What makes a ‘good’ plumber? A keen interest in physical work – be it metal or woodwork, mechanical, construction and so on. Experience versus formal training? In this industry, on-the-job training is far more valuable. The general ‘know-how’ is what instills confidence in clients and efficiency when it comes to doing the actual work to a satisfactory and compliant standard. Describe a typical day We rotate between numerous sites, attending to plumbing emergencies. Every job has a new client, a new unique problem that needs solving and presents a new opportunity to gain another lifelong client. People buy from people and your personal ability to communicate, reassure and advise is key. What do you enjoy most? The fact that we know we’ll have work the next day based on great service, solid advice and a keen interest in accommodating our clients’ needs. Anything you don’t like? The fact that we have to do so much paperwork to track our services and clients! What’s been the highlight of your career? The opportunity to train up new plumbers. Knowledge should be transferred to the next generation so as to ensure that our great country doesn’t get flooded with non-qualified individuals – this only results in buildings going up with inferior structural work, resulting in major complications for homeowners. Your goals for the future? We aim to establish a national company servicing client’s plumbing emergencies. We also hope to, eventually, take over the structural plumbing insurance from all insurers and banks. Any advice for newcomers? Spend your first few years gaining as much knowledge as you can from active artisans with a busy workload and adequate exposure. Be eager to work overtime and save money. Don’t make unnecessary debt. Most plumbing professionals learn their skills through an apprenticeship programme, which combines learning on the job with study at a technical college or training centre. While short intensive or distance learning courses may act as a useful introduction to the industry, they are unlikely to cover enough of the knowledge and practical skills needed to become fully qualified. It is very important to check how much time is given over to work placements and whether the course is accredited. Once the theoretical learning and practical training is completed, it is mandatory for graduates to take the industry Trade Test. They can then register with the Plumbing Industry Registration Board.